Admire lo más destacado de Abu Dhabi y visite el galardonado Museo del Louvre en esta excursión de un día desde Dubai. Conduzca a lo largo de la pintoresca Corniche, haga una parada para tomar fotos de la Mezquita Sheikh Zayed y el Palacio de los Emiratos, y disfrute de las vistas de la Isla Yas. 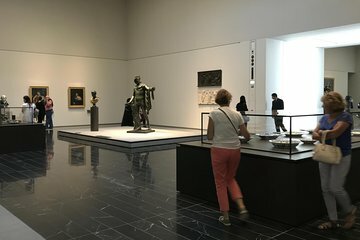 Finalmente, disfrute de una visita autoguiada al Museo del Louvre de Abu Dabi y admire las obras maestras de artistas como Da Vinci, Picasso, Bellini, Matisse y Van Gogh. Visita autoguiada del Museo del Louvre: explore a su propio ritmo. El tour en grupos pequeños asegura la atención adicional de su guía. If you have a day to spare in Dubai, do yourself a favor and take this tour to Abu Dhabi, the capitol of the United Arab Emirates. The small size of the tour group results in an increased attention from the tour guide to the individual members of the group, and our guide Muneer was very knowledgeable of the various historical and cultural aspects relevant to the tour. The highlights of the tour started with a visit to the stunning Sheikh Zayed Grand Mosque, then a brief stopover at the opulent Emirates Palace. This was followed by a 2-hours long visit to the Abu Dhabi Louvre museum for a variety of artifacts and works of art from all parts of the world. The tour ended at Ferrari World adjacent to Yas Mall, which some members of the tour had chosen to visit instead of the Louvre. The tour ended with a scenic drive back to Dubai in the afternoon.